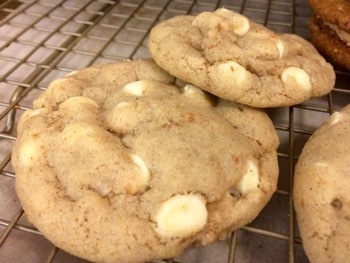 WHITE CHOCOLATE CHIP MACADAMIA NUT COOKIES UPGRADED WITH TOASTED COCONUT!! Toasted coconut, white chocolate and macadamia nuts - like a vacation to the tropics in a crispy on the outside, chewy on the inside cookie. Inspired by the favorite ingredients of Cat's favorite comedian, Meera Manek - hopefully these will put a smile on your face and make you laugh with joy too!